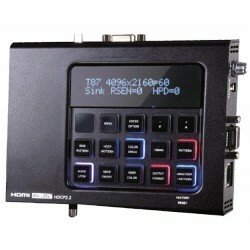 Generates over 100 video patterns for setup, calibration, and testing 4Kx2K 60Hz 4:4:4 HDMI displays/components. Test for HDMI 2.0a and HDCP 2.2 operation. The MONTEST-HD4K Ultra HD Video Test Pattern Generator generates video test patterns for evaluating and testing HDMI displays and components up to 4Kx2K at 60Hz (4:4:4). HDMI timing, data packet, EDID and HDCP analysis are supported, along with EDID upload and emulation. It also supports audio test signals including a built-in sine wave tone generator. The 4K UHD Test Pattern Generator can be conveniently controlled via the front panel buttons, IR remote control, Ethernet or RS232. 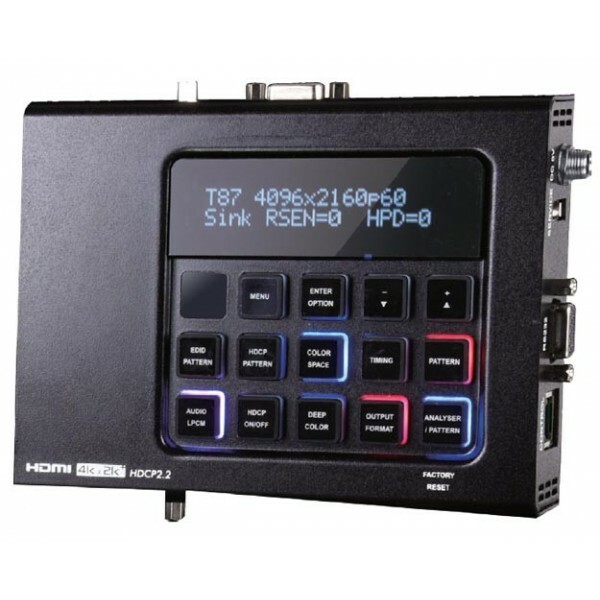 These controls allow selection of timings, patterns, color spaces, HDMI/VGA output, and audio signal type. 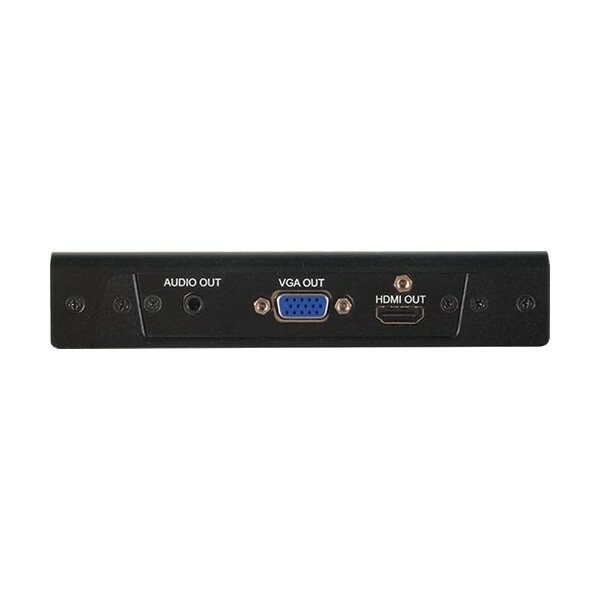 Supports HDMI resolutions up to 4096×2160 at 60Hz (4:4:4). Supports VGA resolutions up to 1920×1200 and 2048×1080. Female HDMI connectors for input and output. HDMI 2.0 (up to 4K@60Hz 4:4:4) and DVI 1.0 compliant. HDCP 1.4 and 2.2 compliant. 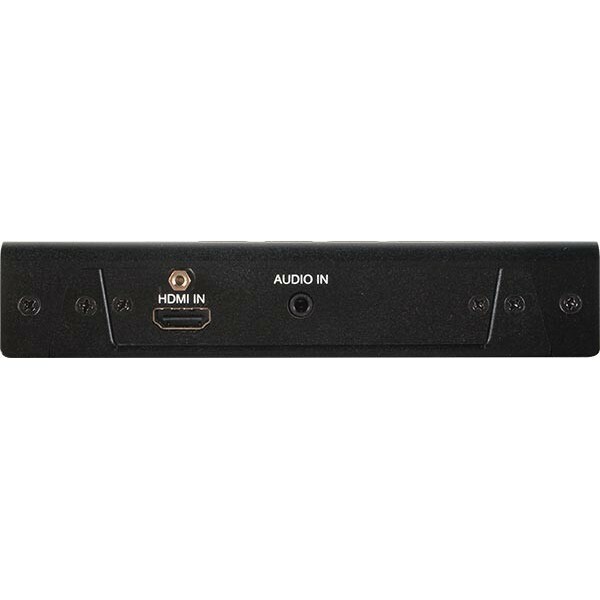 HDMI output resolutions supported: 350p, 480p, 576p, 720p, 1080i, 1080p, 640×480, 800×600, 1024×768, 1280×1024, 1366×768, 1400×1050, 1440×900, 1600×900 (RB), 1600×1200, 1680×1050, 1920×1200 (RB), 4096×2160 (30Hz and 60Hz). Connectors: 3.5mm stereo audio jacks for input and output. One female 3.5mm port for IR receiver. Multi-function and multi-color backlit front panel buttons allow for easy operation. Input: 100 to 240 VAC at 50 or 60 Hz via AC adapter.